Imagine a week away in the hidden hamlet of East Moriches just minutes away from the Hampton Beaches and an hour drive from NYC. Enjoy this relaxing getaway destination for wildlife, on-site kayaks, fishing, pristine white sand beaches, lush gardens, biking, and hiking. This 2 bedroom bungalow with large master suite offers quiet natural beauty with flashes of water views and the ultimate patio deck overlooking Hart Cove to entertain and BBQ. Walking distance to quaint town for sushi, ice-cream, local fish and farmers markets, wine store, antique shops, bakery, and hiking park preserve. Washer/dryer and access to on-site kayaks, and outdoor games of croquet, badminton, volleyball and horeshoes. Winter chalet activities include cross country skiing trails and ice skating ponds just minutes away. The property boasts 2 fireplaces to keep you toasty warm! Captain John Redmond and Brandi are expecting a family in the next coming months. 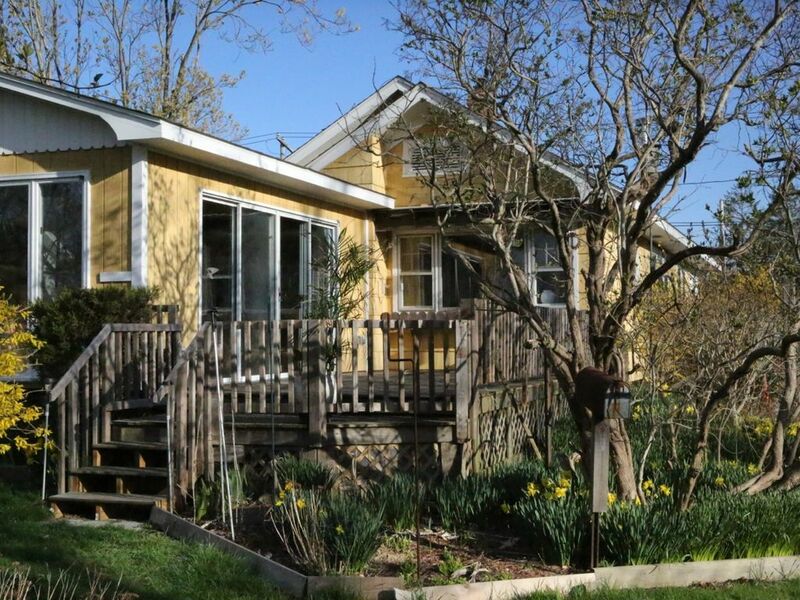 This house is located in one of the most historic and peaceful hamlets on long island. As John was born and raised on Long Island, only the locals know about the hidden hamlets! Television for movies. Sorry no cable TV. 2 Kayaks and 2 Paddles. 1 Life preserver suitable. I spent a full month at this little East Moriches house and I could not have been happier. East Moriches and neighboring towns have somehow been spared the overdevelopment, traffic, and pretentiousness of the Hamptons, while offering all their natural beauty. Like most houses in the area, this rental is a small single story home on a large piece of property. The furnishings are simple, the wood floors pleasantly scuffed and homey - no worry about accidental scratches - the bathroom is new, clean, and spacious and the kitchen, too, is large with a gas stove and sturdy kitchen table that is also impervious to unintentional damage, and the whole house is easy to keep clean and tidy. I woke up to birdsong only a few feet away in the bushes that surround the master bedroom window. I was able to easily drive the 1.5 hours in to Manhattan and Brooklyn to see family, and they could easily visit me. I ran daily at the Terrell County Park - five minute's drive away with no charge to get in - on a sandy wooded circular path that led down to the bay. There, I saw the ubiquitous Long Island box turtle and heard the "drink of tea" song of the many nesting towees. And when I wasn't running, I was antiquing, or swimming at the small bay beach with public access that was 2 miles away, a perfect distance from the house for a walk or bike ride. All equipment provided, like bikes and kayaks, was in excellent condition and easily accessible, and the back yard and deck, were much larger than I thought when I committed to the rental. Neighbors are close, but the rear decks (both screened and outdoor) and yard felt private, and all neighbors, in fact everyone, neighbors on both sides, neighbors I met on the street and people in the town and at the old fashioned hardware store, were friendly and welcoming. Though the water view from the house is somewhat limited in July by undergrowth and trees, it is certainly visible, and a sense of the inlet that is at the end of the dead-end street is always present. I heard the call of terns fishing at sunset's low tide, the Canadian Geese gathering each evening to roost, and the call of the ospreys nesting on a light pole near the parallel street's small marina. If you want some of the glitz of the Hamptons, West Hampton Village is only 15 minutes away, as is a small airport, the departure and arrival point of the New York to W. Hampton Jitney. I am so glad I found this little house and hope to return again and again. Charming, relaxing, and a place to connect. Our family of four had a wonderful experience in this adorable cottage. The owners left thoughtful notes and touches everywhere. The house is very laid back and comfortable. We immediately felt at home. Our daughters (ages 15 and 18) loved the screened in porch and used it to relax and do yoga. We took their advice and went to Silly Lily’s. We rented a small motorboat (around $175 for the day) and were so glad we did. We found a small, private sandbar just off the beach and spent the day in peace searching for clams and mussels (this was right before July 4th so to find quiet during a hot day was remarkable). The kitchen had everything we needed to do a seafood boil for dinner. We were close enough to go to Montauk, and see the Hamptons scene all in one day. Montauk point was gorgeous. Traffic can be sketchy because the entire island is packed. While we enjoyed seeing the hyped up places, we were happy to return to our peaceful little corner. If you want a pristine hotel room, this is not for you. If you want to feel completely at home,this is a great little place to unwind. We had a wonderful time staying at the bungalow with large backyard and garden. We loved sitting on the deck with coffee in the morning and watching the birds, squirrels and even a beaver walked by. Everything was nicely updated and allowed us to go explore the area nearby. We had a great time. Charming bungalow, lovely community, and perfect location for attending the US Open at Shinnecock Hills. A 3 day minimum stay is required. Discounts applied for weekly and monthly stays.